If all goes well, by the time you close this book I will have convinced you that, despite the spontaneity you may exhibit, you are far more predictable than you are willing to admit. This is by no means personal. I am just as easy to forecast, as is everybody with whom I live and work. In fact, algorithms built in my lab to discover how predictable we are were tested on millions of individuals and failed only once. His name was Hasan. Hasan Elahi, to be precise. It was the anxiety in the air that caught Hasan's attention as he sized up the fifty or so foreigners detained by the Immigration and Naturalization Services at the Detroit Metropolitan Airport. "You could just tell that this was their first day in the U.S., and you could see the fear in everyone," he recalls. "I was just confused -- what am I doing here?" With a passport as thick as a cheap paperback novel, having been extended three times to !t the visas and the border stamps he collected during his travels, Hasan knew a few things about immigration. One of them was that U.S. citizens don't get pulled aside by the INS when they return home. At least, they don't normally. More puzzled than scared, Hasan tried to strike up a conversation with the guards, only to realize that they were just as confused as he was. Finally, a man in a dark gray suit walked up to him and, bypassing any introduction, said in a matter-of-fact tone, "I expected you to be older." The man was in his fifties, and Hasan thought his greeting extraordinarily awkward, so, in an attempt to break the tension, he tried a light-hearted response. "Sorry, I am trying to age as quickly I can." It didn't work -- the time and place just wasn't going to accommodate humor of any sort. So he decided to get to the point. "Can you explain to me what is going on?" The man looked at him, paused as if trying to find the right way to put it, and finally just shrugged, replying in a voice devoid of emotion, "Well, you've got some explaining to do yourself." It was June 19, 2002, and Hasan Elahi, a thirty-year-old media- installation artist, was on his way home after a grueling six-week-long trip that started with a flight from Tampa, Florida, to Detroit, hopping from there to Amsterdam, Lisbon, and Paris, to finally land in Dakar, Senegal. Ten days later he took a forty-eight-hour-long bus ride to Bamako, Mali, and then crossed over to the Ivory Coast. After visiting the largest church in Africa, built to hold three hundred thousand worshippers in a country with only forty thousand Christians, on May 28 Hasan arrived in Abidjan, a major port on the country's southern shore. By then he was tired. "West Africa gets to you after a while. It tests your patience," he recalls, so after the ceiling of his hotel room caved in during a storm, he decided that it was time to get out. He flew back to Dakar, only to find himself on a bus once again a day later, heading to Bissau, the capital of Guinea-Bissau. He then crossed two more borders and got his bleach-blond hair braided with red stripes in Gambia before making his way back to Senegal. It took Hasan about six more days to finalize his art installation for the Dakar Biennale, after which he returned to Paris, took a train to Strasbourg, walked across the German border to visit a museum famous for its digital art collection in Karlsruhe, dropped by the Documenta exhibit in Kassel, and flew from Hanover to Faro, a tourist resort at Portugal's southern tip. After two days on the beach, he slept at the Lisbon airport the night before his morning flight back to the United States. And so, by this time, smelling quite ripe and with red dreadlocks sprouting out of his head, in a small interrogation room in Detroit, Michigan, Hasan tried to find a reasonable answer to the reasonable question the man in the gray suit had just asked him: "Where were you?" Where to start? He decided to keep it simple. "Well, I am just coming back from Amsterdam." "Where were you before that?" came the next question. "Where were you before that?" "In Faro, on the beach." Step by step, Hasan traced back the stations of his journey, finally arriving in Dakar. "Where's that?" asked the man. Hasan looked across the L-shaped wood-grained table and realized that this was not a test or a joke -- his interrogator didn't exactly know where Dakar was. "So, I still don't know what's happening, but I am kind of assuming that this has probably something to do with terrorism and that I am some kind of suspect and this is some kind of government or law-enforcement official I am talking to," he recalls. "Obviously you can't get angry at them, and you can't say that you are an idiot for not knowing what the largest city of West Africa is. As much as you want to say it, you just don't. You have to play cool and act professional." So with his fingertip Hasan drew on the desk an imaginary map of Africa, pointed to the continent's invisible western corner, and explained Dakar's significance as a transit point to the United States during the slave trade. "Any Muslims there?" came the next question. "Yes -- about ninety-five percent of the population," responded Hasan, only slightly ironically. "Whom do you meet at these places?" "Other artists -- you know, people who work in art business, writers, journalists," responded Hasan. He proceeded to patiently explain the day-to-day of the art business. "What kind of art do you make?" Once again, this wasn't easy to answer. Hasan is an artist, but not the kind whose work you can hang in your dining room. His pieces are light on aesthetics and dense with ideas, representing witty and, I think, poignant commentaries on our world. Take, for example, the installation he did in Dakar, a fifteen-foot-tall communication tower built from bamboo sticks with a long TV antenna on the top. Four neon lights filled the room with blue light, accompanied by a speaker emitting random hissing sounds. For the uninitiated, none of this makes any sense. Yet each element had its purpose. The first thing that struck Hasan upon his arrival in Senegal was how blue everything was. "Especially if you were standing at the edge of the ocean, the blue water and the blue sky, it is absolutely gorgeous," he recalls -- hence the blue neon lights in his installation. The other thing he noticed was the sharp hissing sound of the Senegalese calling to each other. Inexplicably, a person knew exactly who was hissing at him, even half a block away. So the recording was essential, testing how the Senegalese would react to an artwork hissing at them. Hasan still laughs as he recalls his interrogator's request to shed light on his art. "I have a hard time explaining this to other artists," he recalls with great amusement, "much less to law-enforcement officials." Given that the work he showed in Senegal was sort of sculptural, he said "I'm a sculptor," and left it at that, certain that mentions of media installations would only confuse things further. Then, abruptly, came the next inquiry: "Do you have a storage unit near the university?" "Yeah." Hasan nodded. He had begun renting one after he moved to Tampa to teach at the University of South Florida. "What do you have in it?" "Winter clothes I have no use for in Florida, furniture that I can't fit in my tiny apartment, assorted garage-sale material because I am a packrat -- just, you know, assorted junk." "No explosives?" the agent asked now, somewhat confused and suspicious. "No, I am certain I had no explosives in there," Hasan responded. And with that, question after question, unraveled the reason for his detention. A few weeks earlier the Tampa FBI had received a tip that a man, hoarding explosives in his storage unit, had fled on September 12, 2001. The name of the suspect was Hasan Elahi. 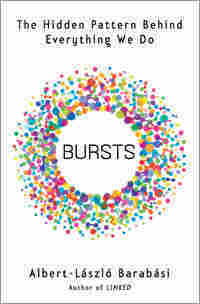 Excerpted from Bursts: The Hidden Pattern Behind Everything We Do by Albert-Laszlo Barabasi. Copyright 2010 by Albert-Laszlo Barabasi. Excerpted by permission of Dutton Adult. All rights reserved.